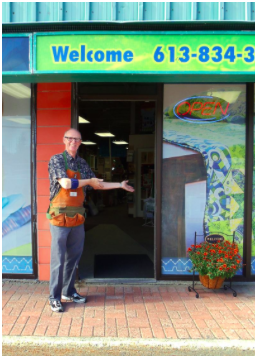 Quilty Pleasures Quilt Shop, Ottawa Fabric and Sewing Machine Store offering a variety of classes on Quilting and sewing. And about time, too. We've had enough snow, freezing rain, slush, and more snow to last us for quite a while. Now it's time for spring, fresh fabrics and new projects. 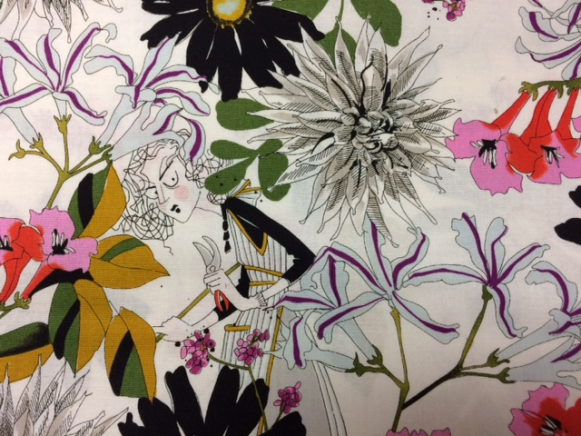 We have funky urban graphics, sophisticated jungle themes, fun designs inspired by pop culture, elegant metallics, and, of course, florals in abundance. Even the Ghastlies have moved to the garden! So get ready to spring into action. Because, no matter what the weather or the season, we still want to sew! PS Please note that we'll be CLOSED ON GOOD FRIDAY, APRIL19, but back to normal hours on Saturday and Easter Monday. Enjoy your Easter -- chocolate for breakfast! WE LOVE TO GET NEW SUBSCRIBERS! sales delivered to your inbox. 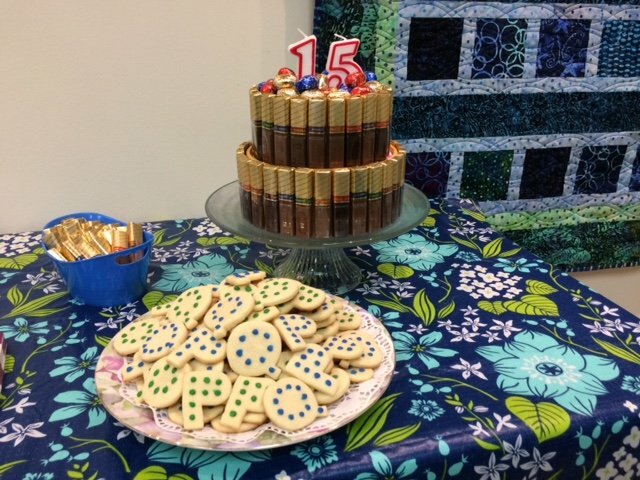 A very big "Thank You" to everyone who came out to help us celebrate our 15th anniversary! It was a beautiful day, and it was very gratifying to have so many of you willing to spend it with us! We also received some very nice messages from those who couldn't attend -- we're sorry you couldn't make it, but thank you for your kind thoughts. And, of course, the big winner is the Gloucester Emergency Food Cupboard: Thanks to you, we are sending them a very nice cheque representing 15% of the day's proceeds. Thank you for your very generous support! See you at next year's party -- we'll be Sweet Sixteen! SPRING CLEANING FOR YOUR MACHINE! Show your machine a little TLC by bringing it in for a visit to the spa! Just think how good it will feel and how well it will sew after some exfoliation and deep-oil massage -- er, cleaning and lubrication -- not to mention relief from its tension headaches and joint stiffness. Our technician, Terry, will be going on vacation for a few weeks, starting in early May. So now would be a good time to bring your machine in for some spring maintenance. As we all know, timing is everything to a well-functioning machine (yuk yuk), so a good spring cleaning and tune up would not go amiss! As quilters, we know it's always more fun to work with colour. Janome knows it, too, so they've introduced a cute-as-the-dickens line of machines that fills the bill very nicely. But don't let the cuteness fool you -- these machines pack a lot of features into a pretty package, and all at a very pretty price. What better way to introduce a beginner to a lifelong love of sewing? Click here to see all the great features! CRAFTY TABLES FOR CRAFTY PEOPLE! Does the thought of threading an overlock machine make you want to run for the hills? 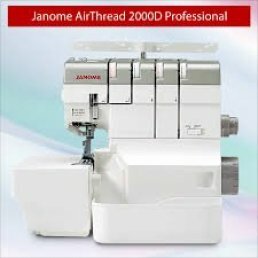 Well, get ready to run your serger instead, because Janome has introduced the new AT2000D AirThread Professional! Its one-push blast air threading system takes all the pain out of threading the loopers, and the built-in needle threader takes care of the rest. Easily converts to rolled hem, too. To see more of the features of this amazing machine, read this. Then come in for a demo, see how slick the threading is, and take your new machine home! 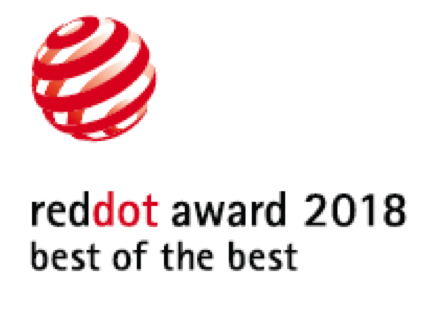 It's our pleasure to let you know that the PFAFF® creative icon™ has won the prestigious "Red Dot: "Best of the Best" design award! The "Best of the Best" award means that the creative icon™ was deemed to be one of the best designed products globally launched in 2017. Only 69 products, or 1% of all nominated entries, have received this award. This includes products from categories as wide as lamps and garden furniture, to ships, planes and trains. The icon has won in the category "Household appliances and household accessories". This category includes vacuums, washers and other large house hold appliances. Congratulations to Pfaff and its fabulous creative icon! With the help of the jury, the internationally organized competition "Red Dot Award: Product Design" appraises the best products of the year. In 48 categories, manufacturers and designers can enter their innovations. The jury only awards a Red Dot to products with a high design quality. The best products of a category are awarded the "Red Dot: Best of the Best"
Have a Featherweight? You Need a Heavyweight! Attention all collectors of vintage Featherweights! Arrow Cabinets has produced a limited-edition cabinet just for you! It fits all 221 black machines perfectly, with no need for an insert, and arrives fully assembled ready to set your machine in at the perfect height. Quantities are limited, just like the 221, so don't wait too long to order your machine's perfect companion. PFAFF creative icon: Sewing vs Driving! 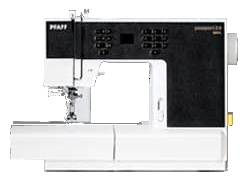 The new Pfaff creative icon ™ sewing and embroidery machine is a truly remarkable, state-of-the-art piece of engineering. And, of course, this kind of quality comes at a significant cost. When the price of the icon is mentioned, the most frequent comment we hear is “I could buy a car for that!”, which is true if you aren’t too fussy about the model. The icon has a much tinier carbon footprint than a car. It runs on thread, not gas. Sewing machines were green before it was cool. Still are. You can drink while driving the icon. Or text. Or watch Netflix. You can put your pedal to the metal and not get a speeding ticket. The icon does not require snow tires or antifreeze. And it will never get stuck in a snowbank. No one expects you to drive them anywhere, or pick up groceries, with the icon. You can convert your garage into a fabric vault or sewing studio, as nature intended. Rush hour will take on a whole new meaning, where the “rush” refers to exhilaration. You don’t have to parallel park the icon. No seatbelts, airbags, or child restraints required. The icon’s safety record is impeccable. You can’t make Christmas presents in a car. Only pollution. The icon will take you anywhere your imagination and creativity lead you. You’re welcome. Have fun with your new Pfaff creative icon!! Sometimes the deals come along when the budget isn't quite ready. Did you know there are several financing options which are always available to help you in the short or longer term? 3 Months No Payment, No Interest is always a great solution because it comes at no extra cost and is available on all machines over $500. If you prefer Equal Payments, there are two plans from which to choose: 48 months or 60 months, each at a cost of just 8.9%. These plans are available for all machines costing over $2000. Interested? Just ask us for details. The process is simple and will put a machine in your sewing room right when you need it. It's going to be a long, cold winter, so why not join us and turn those snow days into sew days? Our winter schedule is full of great classes that will help you master new techniques, make new friends, and create some terrific projects. We even include recess! Take a look at the class schedule here. TAKE A PASSPORT TO CLASS! Carting your machine back and forth to classes can be a pain -- literally. Lighten the load with Pfaff's fabulous little passport 3.0! Weighing just over 6 kg, it's lightweight and compact, making it a perfect travel machine. 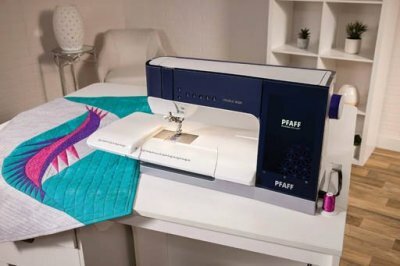 But that doesn't mean you have to sacrifice features -- the passport has Pfaff's famous IDT dual-feed system, 100 stitches, full electronic functions, built-in thread snips, and it takes all of your standard Pfaff feet. Add the extension table (which travels in its own bag, securely attached to the machine's hard carrying case), and your passport 3.0 can take you anywhere you want to go! Often*, when you attend a class at Quilty Pleasures, you have the option of borrowing a classroom machine instead of bringing your own. This not only makes travelling to class easier for you, it also allows you to see what's new in the world of machines. 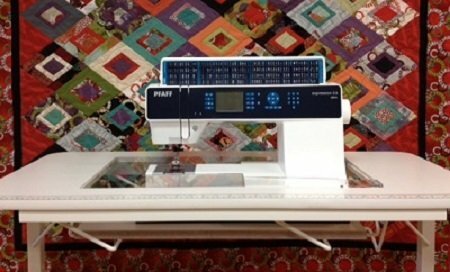 The Pfaff quilt expression 720 offers lots of light, lots of throat area, and the incomparable IDT dual-feed system. From the top of the hugely popular expression series, it has all the features you'll learn to love while being user-friendly and amazingly easy to operate. We have it set up in a Crafty Table, too, so you can be really comfy. Just advise us at the time you register for a class, and we'll make sure to have a machine ready for you. *Because of the amount of homework involved, we don't recommend using a classroom machine for Quilting I. For that class, it's better to bring your own machine with you. 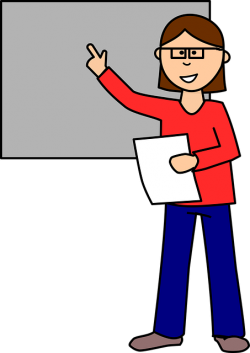 That way, the teacher can help you with any issues that arise. However, if you'd like to buy a new machine, that's still an option! for all the latest QP happenings. If you want our Facebook postings to pop up on your news feed, visit our FB page, click "Follow". (it's next to the "Like" button. Hovering over the "Follow" button will show you a menu with the "Get Notifications" option. Selecting this means you will be alerted in your notifications window whenever we post something. So easy to be so connected! We continue to collect cuddle quilts for the Montfort. If you've never made one before, a word of explanation: These are small baby quilts that are placed in the neonatal incubators and bassinets, so the size is restricted to between 22" x 22" and 24" x 24". Their small size also makes them perfect for testing block patterns, busting your stash, and practicing free-motion quilting. Keeping in mind the intended recipients are newborns, please aim for cute and cheerful, using only 100% cotton or flannel in the top and backing, and 100% cotton thread for the construction and quilting. Cuddle quilts are typically sent home with the babies who use them, so there is a constant demand for them. Thanks very much. Your donations will be gratefully appreciated! We can special-order products for you! It happens all the time: You're reading someone's blog and they recommend a pattern, book, notion, or other item that you'd really like to have. Only trouble is, either they don't sell it or you don't want to order it from them because of the exchange rate, shipping costs, Customs issues, whatever. Let us deal with it! We can usually order these products from our suppliers, and all of the hassles are taken care of. No fuss, no muss, and your order comes right to the store and into your hands. We know that price is a big factor when shopping for quilting supplies, and it's easy to assume that big box or chain stores will always offer a better price than an independent quilt shop. However, we recently have had several customers tell us of specific instances where our prices were equal to or better than our competitors', even after their 50% discount was applied. We appreciate knowing that people are paying attention and realizing that our prices are competitive, even though we're a small, local business. To our watchdog customers: Thanks very much for doing the math! We try our best to offer classes that we think will appeal, but we are always open to suggestions. If there is a class that you would like to take but we aren't offering, just let us know. And if you have a group of friends who would like to take a class together, we can arrange that, too.